Foxglove flower stalks reach between 2 and 5 feet tall and are adorned along their length with a multitude of small, bell-shaped flowers. They are available in a choice of colors, including white, pink, yellow and purple. As a biennial plant, foxglove only survives in the garden for one to two years. For this reason it is usually grown in annual beds. Properly caring for the foxglove ensures that it blooms well and also encourages it to set seed and self-sow in the garden so that you do not need to start new seeds every year. Break up the soil in the bed prior to planting to a depth of 1 foot, using a tiller or spade. Foxglove has a long taproot that thrives best in loose soil. Apply a 2-inch layer of compost over the bed prior to planting. Work this into the loosened soil. Compost adds nutrients and helps maintain proper soil moisture. Water foxglove regularly from spring planting until the plant dies back in fall. Water one or two times a week, thoroughly wetting the soil until it feels moist to at least a 6-inch depth. Lay a 2-inch layer of mulch, such as wood chips, around the plant. Mulch prevents weeds and preserves the moisture in the soil. Remove the central flower spike from most of the plants after the foxglove finishes blooming. This encourages side shoot production and more flowering. Leave spikes in place on one-third to one-half the plants for seed production and self-sowing, if desired. Replenish the mulch and compost each spring when the foxglove begins actively growing again. Lay a ½-inch layer of compost over the bed, and then top it with a 2-inch layer of mulch. Foxglove seeds require light to germinate. If you mulch in fall, apply it prior to seed formation, so the seeds do not become covered with the mulch. Foxglove produces the potent substance digitalis, which is used to treat heart conditions. 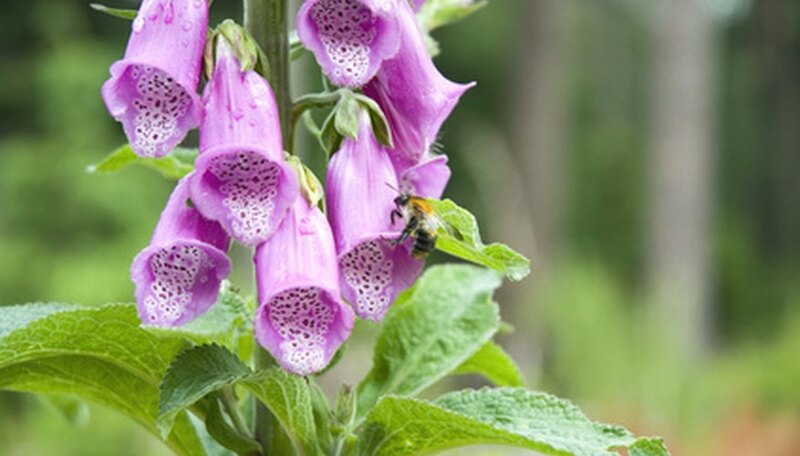 Digitalis is considered poisonous, so avoid planting foxglove where children or animals may eat it.